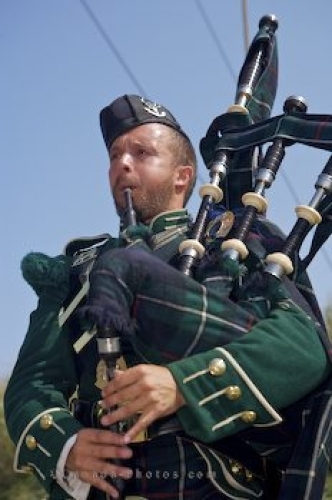 Bagpipe music is a pleasure to listen to especially for those people that are of the Scottish descent and here at the Halifax Citadel National Historic Site in Nova Scotia, Canada, the music rings clear. At the Halifax Citadel National Historic Site in Halifax, Nova Scotia, people can listen to the amazing Scottish music that is played by the members of the 78th Highland Regiment. This man is dressed in his entire Scottish uniform as he performs his bagpipe music for the crowds that come to the Halifax Citadel. Bagpiper playing Scottish music at the Halifax Citadel National Historic Site, Halifax, Halifax Metro, Nova Scotia, Canada. Picture of a man and his Scottish bagpipe music at the Halifax Citadel National Historic Site.